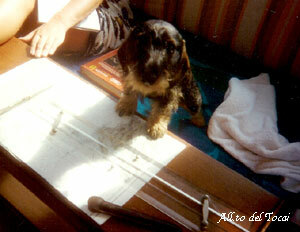 Do you remember Ottimo Massimo, the alert and inquisitive dachshund who was staring after The Baron in the Trees’s evolutions in the sky, in the homonymous novel by Italo Calvino? Sometimes he allowed himself some pleasant, lonely runs in the wild, hunting games; used to come back and give his trust-worthy support to his friend up on the trees. 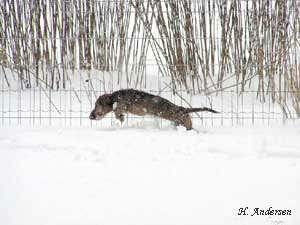 I don’t know if Italo Calvino had never owned a dachshund, but he surely had the opportunity to know this race deeply. In fact, the dachshund is just a “ottimo massimo”, a small-big dog able to devote himself to his lord, to keep a proud and wilful individuality, both to play calmly with children and become a fearsome caretaker, being satisfied to occupy beds and sofa (of course, if allowed) and gifted with art of hunting, run through fields, woods and brooks, heralding of irreplaceable hunting adventures. Friendly by nature, neither nervous nor aggressive, with even temperament, the dachshund is an irreplaceable dog kept for company, usually bought for that reason. 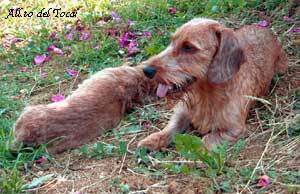 He is also a passionate, persevering and fast hunting dog with an excellent nose. He is often used in holes and on the ground because of his excellent results. Dogs very short in legs, like nowadays dachshunds, can be found in medieval engravings and sculptures, without mentioning the interesting Egyptian basso-rilievo of the XII pharaonic dynasty dated back to 2000 B.C. We don’t want to “offend” our dachshunds but their “short legs” are surely the result of a genetic mutation. Up to now, in farmhouses it is still possible to find short-leg half-breeds, sometime very, very short, and very out of proportion with respect to their body. All over the years, breeders have worked on “short-leg” feature, selecting subjects fitter to hunt in holes and on the ground. In all probability, the first race selected had been the smooth-haired, then the wire-haired (passing through crossbreeding of Schnauzer and Dandie Dinmont Terrier) and the long-haired (passing through crossbreeding of the Wachtelhund, the German Spaniel). In 1879 the dachshund, born in Germany, had got the first Standard drawn-up in the history and in 1883 had been presented to the first dog show in Berlin. 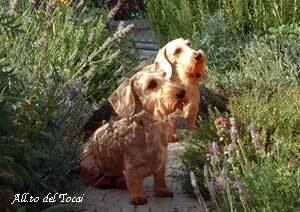 Dachshunds compose the Group number IV of the F.C.I. (Fédération Cynologique Internationale), which consist of nine races separated according to the size (Standard, Miniature, Kaninchen) and to the kind of hair (Smooth, Long, Wire). 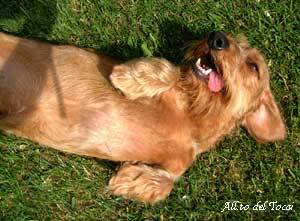 In Italy, their belonging to one of the three sizes is stated in a dachshunds’ meeting as well as in a national or international exhibition; your dachshund has to be from one year old on. After having checked and excluded any sort of defect preventing the dog from breeding, an expert judge will measure the dachshund’s chest by a centimetre. Once made and recorded this issue, the dachshund will officially belong to one of the nine races and can be admitted to the breed. Kaninchen chest measurement can’t exceed 30 cm.